..Its Christmas Time.. In Chadron High! Trying too hard to make the 'nice' list! Pre-Calc - Egg Bungee Drop! Pre-Calculus students finished the semester by running an experiment and using their test data to make a prediction. Each student was given 6 rubber bands, cheese cloth, a paper clip, meter stick, and an egg. They were to build a harness for their egg and attach a rubber band bungee cord. They took measurements of total stretch based on one, then two, three, etc. bands. They did several tests jumps at each increment and took an average to help with human error in the trial. They then input their data into the statistics capabilities of their graphing calculators to generate an equation that gave # of rubber bands vs. max jump depth. They were then randomly assigned much longer lengths, up to 8 feet, and were to use their equation to determine the number of bands needed to do the jump. They were assessed points based upon smallest distance from the ground and were also assessed if their egg hit the ground. All of us who work in education have broken hearts and are haunted by the tragedy visited on the educators, students, and families of the Newtown Public School District and Sandy Hook Elementary School. Whenever a school experiences violence and the lives of children and adults are lost, we struggle to find words to express our emotions and explain how this could have happened. Schools are among the safest places for children and adolescents in our country, and, in fact, crime in schools has been trending downward for more than a decade. Nationwide statistics, however, provide little solace when 20 first-graders and six adults are senselessly gunned down in a small town’s elementary school. Accounts from Sandy Hook indicate that the school’s heroic principal and her staff had safety measures in place and had practiced their emergency procedures. As a result, children’s lives were saved and an even greater tragedy was averted. Not all tragedies can be prevented. But schools and districts need to be ready to handle crises, large and small, to keep our children and staff out of harm’s way and ready to learn and teach, and to recover from such tragedies should they occur. As we reflect on what happened last week in Connecticut, I want to share some resources from the U.S. Department of Education’s Readiness and Emergency Management for Schools Technical Assistance Center that may be helpful to you and your team, now and in the future. As hard as it is to talk among adults about such a tragedy, it can be even more difficult to talk with students and our own children. Helping Youth and Children Recover from Traumatic Events is a compilation of resources from the Department of Education, other federal agencies, and counseling experts. It is so important to give children the chance to talk, write, or draw to express their emotions. Please create the time and space for them to do that. The Department also has several resources on Creating and Updating School Emergency Management Plans. If you do not have a crisis plan in place, please take steps to develop one. Engage a variety of school personnel and community partners. Plans should be comprehensive, anticipate a variety of hazards, and focus on the four phases of emergency management: prevention-mitigation, preparedness, response, and recovery. If you do have an emergency plan in place, please review it, update it as necessary, and practice that plan regularly. Knowing what to do when faced with a crisis can be the difference between calm and chaos. The Department of Education’s first priority is to help the Newtown community cope in the aftermath of this horrific event. In the days and weeks ahead, we will work with state and local officials, as well as Congress, to do everything in our power to help Newtown begin the long process of recovery. As President Obama said, our country has suffered through mass shootings and gun deaths of young people too many times, in too many places. As a nation, we must find the courage and the conviction to take meaningful action to prevent more tragedies – now. As you take steps to prevent and prepare for possible emergencies in your community, you have my full support and deepest gratitude for taking on this difficult yet necessary work. Thank you for the difference that you make in the lives of our country’s children. If you have questions or need additional assistance, please contact Paul Kesner atpaul.kesner@ed.gov or (202) 245-7889.
iPad Insurance Quotes - Dec 21st Deadline! DEADLINE FOR POLICY SIGN UP IS DECEMBER 21st! To sign up, Go to www.gocare.com/chadron and sign up there. If you would like to purchase by check please make check to GoCare Warranty for the amount of policy and fill out form by table. Checks can be dropped off at the high school office. REMINDER: DEADLINE FOR POLICY SIGN UP IS DECEMBER 21st. More information as well as the GoCare Membership Agreement can be found on the CPS website. Click on links under Technology or the article on the front page. Please visit with us if you have any questions. CHS construction was able to add tiling to their class this semester thanks to the tile and grout donations from Morford's Decorating. Students in Mr. Cogdill's construction classes have already been gaining hands-on experience with sheet rock, tape, texture, plumbing, electricity and painting. With the addition of tiling, students work with partners to complete an entire bathroom module during a semester-long class. 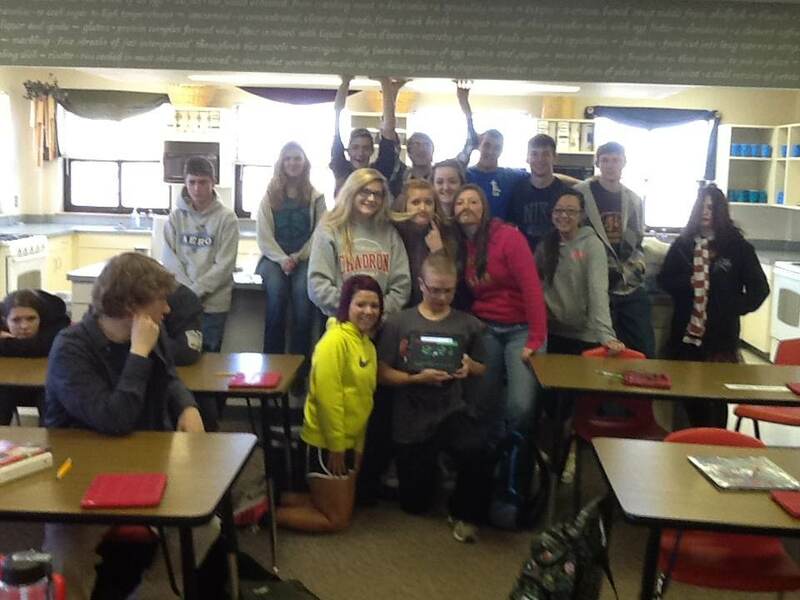 Mrs. Budler's third block Personal Finance class takes a moment out of class to capture the12-12-12. 12:12:12 event that will only happen once in their lifetime. The FBLA Cake Raffle has become a tradition at basketball games. For $1.00 you receive 5 chances at one of five cakes. The money from the raffles has always gone to support members of FBLA and their quest to attend State Leadership Conference. However, this Saturday, December 15th. The FBLA Cake Raffle will participate in the Nebraska National Guard Canned Food Drive. One can of food for one ticket in the cake raffle. Of course you can still purchase a ticket in which all money raised will purchase food for the canned food drive also. We look forward to everyone coming out and supporting Cardinal Basketball this weekend and bring your food items to enter the FBLA Cake Raffle. Thank you for your support! Only Two iPad Deployment Programs Remain! After last night, we now have only two remaining times for students and parents to attend an iPad deployment program. The two remaining times are both tomorrow (Thursday, Dec 13th) at 3:30p and 6:00p in the high school auditorium. The programs involve signing contracts, covering insurance information, digital citizenship, acceptable use and care, as well as iPad set-up. The programs take about an hour to cover the necessary information provided by our Tech Department. We encourage any student that has not received an iPad to attend one of these remaining sessions. Parents that are uncertain whether they want an iPad for their student should also attend so they can hear the full information provided prior to making their decision. We look forward to the opportunity to learn with technology for our students! Charity Basketball Game this Sunday! 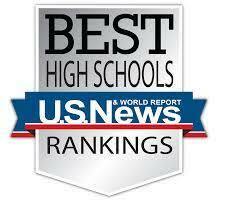 For the most accurate information regarding the many activities of Chadron High School use schedulestar.com. This is the very program that our activities office uses to enter all of the extra-curricular and school activities. Click the "Upcoming Activities" tab above to view our high school activities hosted on schedulstar. On Sunday December 16th at 2 PM the Chadron High School Speech and One Act teams will hold a fundraiser in the high school auditorium. Students in the two activities will present a series of Christmas stories for the public to enjoy. All ages are welcomed to attend. The cost is $4 for students K-12 and adults.